Melon With Orange-Ginger Syrup | What about this? Cool and refreshing – what more could you want from a recipe using ripe summer melons? How about something unexpected? The first few bites of this sweet melon mélange reveal subtle hints of orange and ginger, but the next few bites pique your interest. A splash of Cointreau elevates the flavors from sophisticated to sublime. Should you serve this dish as a salad or as a dessert? Your choice – it’s great for both! 1. Fill a large bowl with ice and water; set aside. Place the orange juice, sugar, and ginger in a small saucepan over medium heat; bring to a boil; Let simmer, stirring occasionally, until sugar has dissolved and syrup has thickened, about 15 minutes. Remove from heat; strain syrup into a clean bowl; add the Cointreau; stir to combine. Set bowl in ice bath, or chill in refrigerator, until syrup is cold. 2. 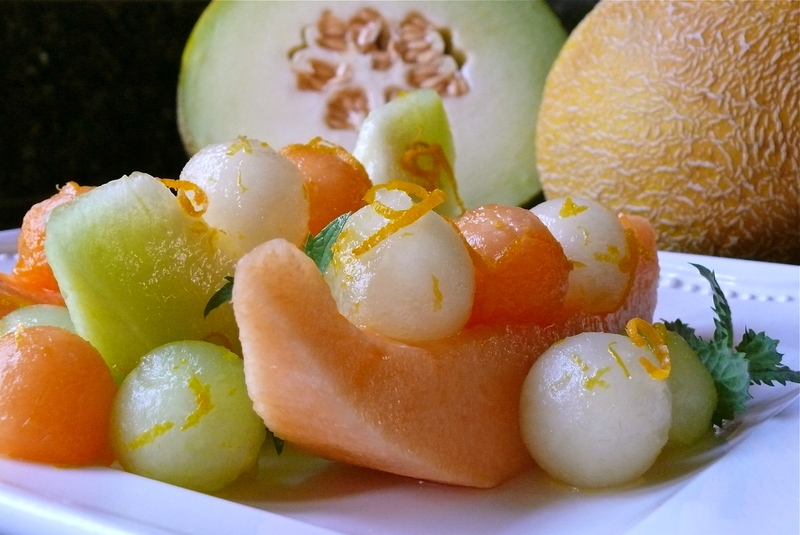 Using different sizes of melon ballers, cut balls from the honeydew and canary melons. Place balls in a medium bowl; add 1/2 cup cold syrup and orange zest. Toss to combine. 3. To serve, arrange cantaloupe on a platter. Spoon melon balls on top. Serve extra melon balls on the side. Drizzle melons with syrup; garnish with mint. Serve with remaining syrup on the side. 1. With all the wonderful melons available, don’t feel restricted to only using the types of melons called for in the recipe. Do, however, try to select a variety of melons that will give you a colorful array of melon flesh. 2. The recipe suggests creating different size melon balls. I’m sure the presentation would have been more attractive if the melon balls were different sizes, but I only have one melon baller. That’s life!